Short Stories of Shapely Seams: 2015 Sewing Design / Inspiration Challenge! 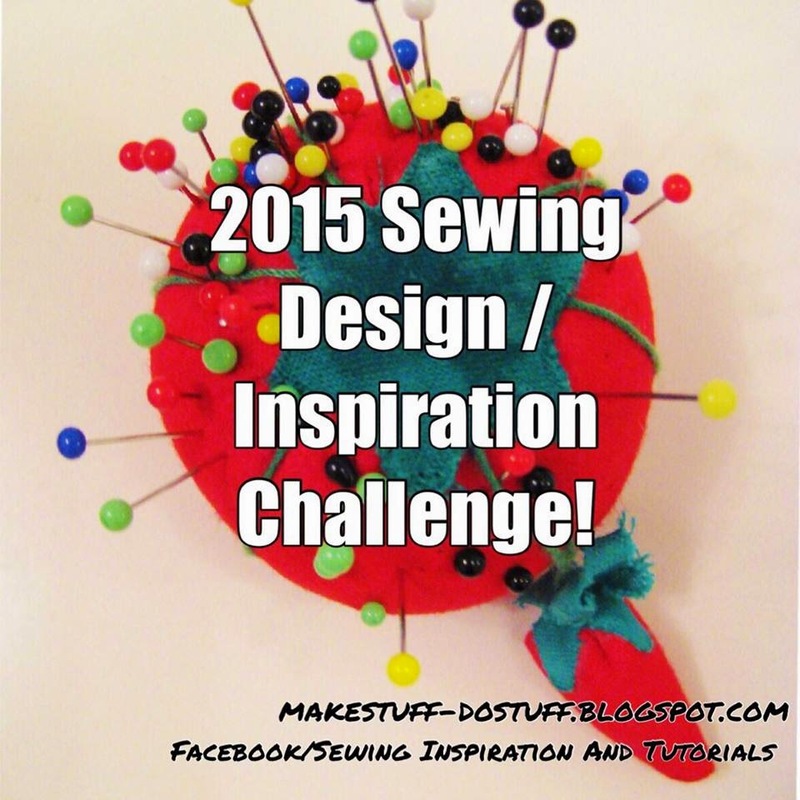 2015 Sewing Design / Inspiration Challenge! Welcome to the overview for the 2015 Sewing Design / Inspiration Challenge. Pull up a chair and make yourself at home! During 2015, there will be a topic or challenge per month to stretch our creative ideas and step outside the box. Each month you can take on a challenge to think differently about the way you design / choose your sewing projects. At the end of the month, we will share our projects! You may share on facebook through the Sewing Tutorials and Inspiration Group, and I will also post pictures here (with your consent) and links to people's blogs to create a gallery of things we have come up with, as well as a chance to find some great blogs out there! There is no winner, no judgement. Just lots of bragging. The goal is to share inspiration, resources and creative ideas. You may participate in as many or as few challenges as you like. (Kinda like Girl Guides?) If you want to get a head start on a project, do that. If you want to share something you made a year ago, but fits with the topic, that's awesome too. Topics will be posted with a description by the end of the previous month to get you started (if you haven't already). Submissions will be due on the last Monday of the month. So in January, that will be Monday the 26th. Please submit your projects via facebook, or the 'contact me' form on this blog. If you are happy to have your facebook pictures included on the blog please let me know - I won't put it up with our your permission. I have tried to set challenges which could apply to both dressmaking or patchwork/quilting projects. You're welcome to colour outside the lines of those boxes too, and apply the challenge as you see fit. Themes are design focused and hopefully broad enough to be interpreted in a range of ways. I'm so excited! What are the themes? Here you go - a complete outline so you can get yourself thinking! January: Create a mood board to refine a look or colour scheme you would like to use in your work. Make something from the mood board. This could even be assembling an outfit from things you already have (hopefully something you made) or creating a patchwork project which suits a particular decorating scheme. February: Play with Shapes – explore silhouette and make a garment with a different shape to your usual choices. OR for quilters, try working with a different shaped block as a basic shape. March: Create something inspired by an unrelated object. Check out this blog for an awesome example: http://teacupcorset.blogspot.co.uk/ And for a related, tounge in cheek giggle - go here. April: Reimagine an item. Upcycle a second hand piece, or pull out a failed project and revive it in a new form. May: Create 3 - 4 mix and match pieces that work together. I know this sounds ambitious, but remember you can pull out stuff you have made before! June: Design your own fabric. Investigate digital fabric printing, like Spoonflower / Woven monkey, or try printing by hand – silk screening / printing etc. Heck, try potato prints. July: Work with a type of fabric you've never used before. August: Employ fabric manipulation such as gathers, tucks, smocking, or origami into a piece. September: Explore the textile styles of another culture. Create an item which reflects a technique or style of another culture. October: Costume Challenge - make an item based on a character from a movie / book / TV show. It can be completely crazy, or a subtle nod. November: Write a tutorial or instructions (or make a video) for a project or technique of your choice. December: Make a ‘memory’ item, inspired by something you feel nostalgic about. Could be a toy similar to one you had as a child, a quilt with memory pieces, or recreate a garment worn as a child / belonging to a relative. Here's to a fabulous and creative 2015! A mood board, or an inspiration board is a visual collection of ideas or a theme you want to create in a piece of work. They're often used by fashion designers / decorators to define and share their concepts. They're fun to make! Follow the numbers to DIY! Skirt #1 - The Vera Skirt.